Inter Dyne Systems offers a variety of pegboard mounting options. •Wall Mount is standard and each pegboard is shipped with a wall bracket that is clearly labeled for installation. •Finished Back Panel can be mounted to a free standing utility chase and the pegboard hung on it. 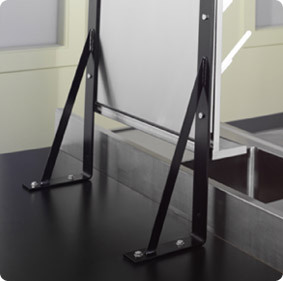 •Free Standing Assembly Brackets are used to install a pegboard to a laboratory work surface. Just add a finished back panel for support . •Raised Top Assembly is best used when space is limited. This assembly allow you to lift the pegboard 12 inches above the worksurface and if desired pegboards can be mounted back to back. •Wall Standard Mount allows you to adjust the height of the pegboard as needed. Mounted on single slot standards the pegboard is shipped with an integral clip system welded to the back.